Mail and printable coupons, discounts, promo codes and more savings. Clothing, grocery, products, services. Start saving today! If you have a cat or a dog, you will appreciate this little saving coming from Iams Canada. 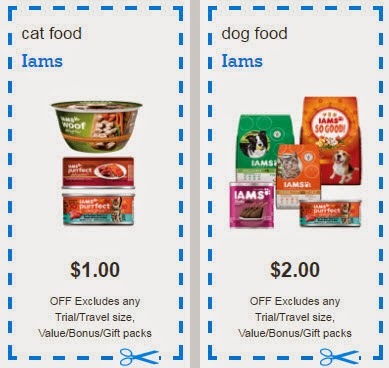 Brandsaver has two Iams coupons for cat and dog food. Get the coupons now! The two coupons available are printable. Print them out before going to your retailer. Thanks! Join our Facebook Page to get the most recent coupons, offers and deals available in Canada! Check out all the newest coupons! Money Savings Apps in Canada. Download'em Today! Where to buy books for cheap in Canada?